HAMLET. Photo by Richard Termine. Lewis Brown is a London born actor of dual British and Caribbean heritage. He moved to Manchester to train at the Manchester School of Theatre, UK, where he was nominated for the Laurence Olivier Bursary Award, before returning to his hometown to work as an actor. Lewis has worked across the UK and Europe. Most recently he joined an international cast in an exciting piece of new writing, The Legendary Children in the House of Fierce (Stitching Art.1/Team Angelica) a story of the homeless LGBT community in New York. This will be Lewis’ first time ‘treading the boards’ across the pond in the United States and is both honoured and excited by the opportunity. Other recent credits include; Nataniel, At the Feet of Jesus (Theatre Royal Stratford) and Pericles, Pericles (Uncanny Arts/Titchfield Festival Theatre). Credits whilst training include; Jacob, Sanatorium Under the Sign of the Hourglass, Sister, Breznev’s Children and Lysander, A Midsummer Night’s Dream. Gys de Villiers is a South African born multi-award winning actor, director, playwright and dancer now residing in New York. Shakespeare credits includes: Titus Andronicus with Sir Anthony Sher (Emperor Saturnine) National Theatre London, Julius Caesar (Julius Caesar), Merchant of Venice (Antonio), As you like it (Both Dukes), King Lear (Gregory). Other theater credits: Waiting for Godot (Vladimir), Buried Child (Dodge), Noah of Cape Town (Musical) and The Double Room (FNB Vita Award -Best Male Dancer). Best Actor Award in a short at The International Filmmaker Festival Of World Cinema 2017 Nice, for his performance in It Gets Better. Most recent international films were Mandela Long Walk to Freedom with Idris Elba and Vehicle 19 with the late Paul Walker. His body of work over the last 36 years includes extensive experience in film (30 features), short films (94), television (20 series), daily soaps (12) and theater (55 productions). He is honored to be working with Aquila and this talented group of artists. Isambard Rawbone is a graduate of the University of Kent (MDrama), with additional training at Identity School of Acting. Most recently, he has been part of the cast of NewsRevue at the Canal Café Theatre, and since 2015, has been performing in Method In Madness as an ensemble member of Entita Theatre, a physical theatre company who specialise in creating innovative work based around the plays of Shakespeare, (International Youth Arts Festival, Edinburgh Fringe, Catford Broadway, Greenwich Theatre, Marlowe Theatre, Old Joint Stock, Croydon Utopia, Mumford Theatre). He is overjoyed to be a part of Aquila Theatre, and to be working in the States for the first time. Michael Rivers trained at East 15 Acting School. In 2011 he founded the acclaimed theatre company d'Animate. Aquila credits include: The Adventures of Sherlock Holmes and Romeo and Juliet. Recent theatre credits include: Continental Fist Fight (Shakespeare's Globe Theatre), Dear Darwin (National Theatre Madrid), Samuel Beckett's Rough's (The Phoenix Theatre), Bitesize Chekhov (The Courtyard Theatre), Richard the III (Rosemary Branch Theatre) Super Tramp (One Man Show at Edinburgh Fringe), A Mid Summer Nights Dream (Shakespearence RSC), and The Green Room (The Mill Arts Centre). Television Credits include: Casualty (BBC), Doctors (BBC), Shameless (Channel Four), The Cafe (Sky One), Locked Up Abroad (National Geographic /Raw TV), and Of Gods And Mortals (Sky Pilot). Commercials include: Heineken, Oral B, HTC and UBS. Michael is also a freelance Director and Writer. Joel Moritz Lighting Designer is excited to be back with Aquila Theatre. Recent New York/ Off Broadway: AZAK, Undeniable Sound of Right Now, A Fable, Scarcity, Yosemite, and Post No Bills with Rattlestick. Slipping and Too Much Memory with Rising Phoenix Repertory and NYTW. Blue Man Group: production and lighting design for the BMG at Universal Studios and BMG National Tour, as well as productions in Tokyo, Berlin, Oberhausen, Amsterdam, Zurich and Sydney. Joel has worked extensively in regional theatre and internationally with productions in Edinburgh, Buenos Aires, Lima, Hong Kong, Paris, Prague, and Cairo. Andy Evan Cohen, Sound Designer, Credits include NYC off-Broadway Dear Jane, In Bed With Roy Cohn, If Only (starring Melissa Gilbert), A Midsummer Night's Dream, and Ay Carmela! ; Our Trojan War (Aquila Theater US Tour, BAM), The American Soldier (Edinburgh Fringe, US Tour, Kennedy Center); The Hungry Hungry Games (US and Canada Tour); and multi-media installations at Werdenberg Castle, Switzerland. Recent work includes scores for the indie film Show & Tell Tango and a performance piece in New Zealand. Education: Oberlin and Manhattan School of Music. Rick Sordelet, Fight Director, Rick and his son, Christian Kelly-Sordelet, are the creators of Sordelet, Inc., an exciting new Stage Combat company bringing over 30 years of action movement experience to the entertainment community. Rick has worked on 72 Broadway productions, including Disney’s The Lion King and Disney’s Beauty and the Beast, as well as the national tours of Disney’s Beauty and the Beast and Les Misérables. His credits include 52 first-class productions worldwide. Opera credits include Cyrano (starring Placido Domingo) at the Metropolitan Opera, Don Carlo (directed by Nicholas Hytner) and Heart of the Soldier at San Francisco Opera, and Cold Mountain, Don Giovanni, Roméo et Juliette and La Funciulla del West at Santa Fe Opera. He has worked on films such as The Game Plan, Dan in Real Life, Brave New Jersey, and The Sounding. On television, he and his son worked as Stunt Coordinators for the hit CBS comedy series Kevin Can Wait and spent 12 years as a Stunt Coordinators for Guiding Light. He is an instructor at the Yale School of Drama and a Board member for the Shakespeare Theatre of New Jersey. 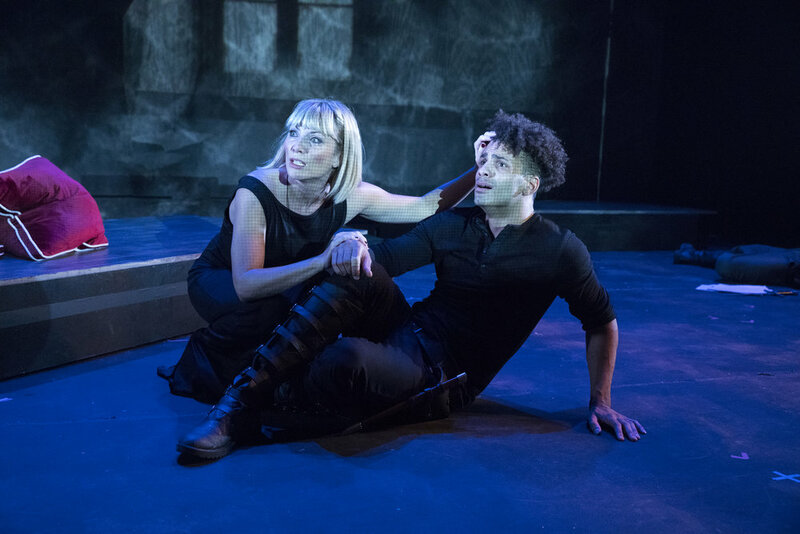 Rick received the Edith Oliver Award for Sustained Excellence at the Lucille Lortel Awards from The League of Off-Broadway Theatres and Producers, and a Jeff Award for Best Fight Direction for Romeo and Juliet at Chicago Shakespeare Theater. He is the author of the play Buried Treasure and the co-writer of the upcoming feature film 20,000 Leagues Under the Sea, directed by Bryan Singer. To learn more, visit www.sordeletink.com. Robert Rogers, Technical Director/Production Manager, has been involved in Technical Theatre for over ten years and served as Technical Director for Aquila’s 2016 Spring and 2014-15 Tour Seasons. His most recent endeavors include Production Manager/ Technical Director for Penobscot Theatre and Technical Director for Gretna Theatre. He has also been everything from Assistant Tent Boss for the Zerbini Circus to a Chief Pilot of Maintenance at a $2.5 million dollar helium balloon in Tennessee. Additionally, Bob spent time in Qinhuangdao, China, where he was the Technical Director for an international cooperation project for the theme park show: Snow White’s Birthday Adventure! Rogers has been working with Aquila for five years! Dana Gal, Company Stage Manager, is thrilled to work with Aquila again on her second tour. Dana hails from the Midwest, got her B.A. in Theatre from Arizona State University and her fellowship at American Conservatory Theater in San Francisco. She has worked in Phoenix, the Bay Area and at various summer stocks on the east coast. For the past four years Dana has worked with Third Rail Projects on their immersive productions Roadside Attraction, The Grand Paradise, and most recently as Stage Manager for their Bessie Award winning production Then She Fell. *HAMLET is part of Shakespeare in American Communities, a program of the National Endowment for the Arts in partnership with Arts Midwest.